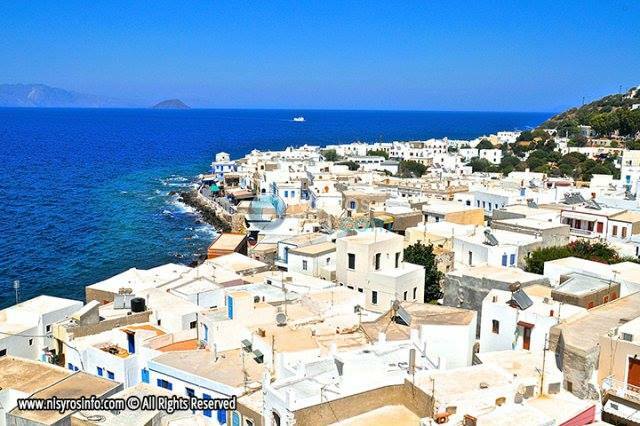 Nisyros is an island located in the southern Aegean and is a part of the Dodecanese group of islands. It also belongs to the group of ancient Southern Sporades, located west of Rhodes between Kos, Tilos and Astypalaia. Specifically, it is located 8 miles NW. of Tilos, and 10 miles south of Kos. A place of wild beauty, as Nisyros was formed by volcanic eruptions. Mandraki is the capital and the harbour of the island, with its white houses built below the imposing rock where the Monastery of the Panagia Spiliani stands. The center of the island is a semi-active caldera created by the eruption that took place 24,000 years ago and covered the slopes of the island with a pumice layer thickness of 100 meters. Nisyros is linked by ferry to the mainland only via Piraeus.. It is also connected with ferries to Astypalaia, Halki, Kalymnos, Kastelorizo, Kos, Naxos, Paros, Rhodes, Symi, Patmos, Lipsi Tilos. In summer there are also many tourist boats that visit Nisiros via Kos on a daily basis. From Rhodes there are dolphins, catamarans and ferries. It is also connected by ferry from Piraeus with Mykonos. There are several hotels and apartments. At Mandraki and Pali you will find hotels, inns and guesthouses. Make your reservation now. Distances in Nisyros are small, so you can cross on foot or you can rent motorcycles. But there are daily bus routes, taxis or rental cars. Despite the fact that Nisyros is a small island, is a very special destination, thanks to its active volcano and the unique geomorphological features. Apart from the volcano it has many archaeological sites and monuments. It is worth visiting the Castle, the monastery of Panagia Spiliani, the various Chapels, museums, and ancient ruins in Argos. Apart from the attractions, the island offers many options in accommodation, food, cafes, sports, excursions, nightlife. The island has not many beaches, but they stand out for its beauty and tranquility. Do not forget to visit the hot springs. For lovers of water sports, Nisyros offers options like swimming, snorkeling and other water sports. Alternatively, you can choose hiking. You can arrange day trips by boat to neighboring islands such as Giali, Pirgousa, Pachia and Stroggili or even take a trip around the island by boat. Boats from Kos have also frequent routes. Finally day trips organized to Alikarnassos, that you can combine with a visit at Kos. For more information refer to nisyrosinfo.com pages. Find information about the villages of Nisyros, the history and the mythology, about sights, tours and activities, that are offered. Through the pages, visitors can book their holidays without wasting time: ferry-flights and rental of transport services. They can also visit Business Catalogue to find professionals or services, and the information center for the most useful phones. Nisyrosinfo.com will never stop be informed and it will always add every information, that is useful for visitors, but also for the residents of Nisyros. Visit Nisyros for relaxing holidays, diving in beautiful sandy beaches.. a paradise, away from the hustle of tourist islands.